Learn how ISFPs view the world and what makes them tick! Listen on your PC, Mac, smartphone, tablet or Kindle device! 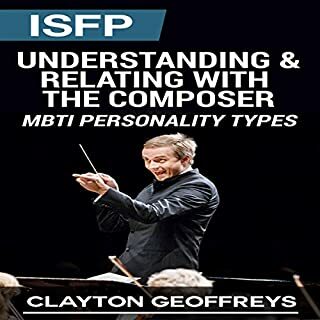 In ISFP: Understanding & Relating with the Composer, you'll learn about the ISFP Myers Brigg Personality Type. This book covers a variety of topics regarding ISFPs (Introverted Sensing Feeling Perception) and why they make such creative individuals. ISFPs are often referred to as the artists of the world in the sense that they love creating things of great value in the fine arts. Have found something I didn't find in other guides of this type. Definitely recommend.